Since 1945, Nicholas Hagger points out, the UN has failed to prevent 162 wars and the proliferation of nuclear weapons. Under the UN, competing nation-states seem powerless to achieve world peace, and there are fears of a Third World War involving the Middle East, the Baltic states or North Korea. In World State: Introduction to the United Federation of the world: How a democratically elected world government can replace the UN and bring peace (O Books, UK £19.99 / US $29.95, June 2018), Hagger continues a tradition that began with the 1945 atomic bombs. He follows Truman, Einstein, Churchill, Eisenhower, Gandhi, Russell, John F Kennedy and Gorbachev in calling for a democratic, partly-federal World State with sufficient authority to attain seven key goals: abolition of war with enforced disarmament, the ending of famine, disease and poverty, and solutions to the world’s financial and environmental problems. Populist and nationalistic revolt against supranationalism has meant that these 20th-century calls are no longer heard, says Hagger, who believes he is now the only Western literary author and thinker to continue the tradition. This is one reason why I have no doubt World State is an extremely important book; for a start, every politician should read it. Persuasive and exhaustively researched, it sets out the historical background — the longings for world government and attempts to impose it by force — and the failures of the current political order of nation-states. It might become evident that the solution to the world’s problems can be arrived at through a cooperative World State rather than economic self-interest, protectionism and isolationism. Clearly much more than a utopian dream for Hagger, he presents his vision of the ideal World State — its federal goals, its structure and the benefits it would bring — and launches a manifesto that would turn the UN General Assembly into an elected lower house of a democratic World State. He thinks there is already recognition that there should be a stronger central authority than the UN so that wars can be stopped and full nuclear disarmament achieved. He feels the time of the World State is approaching and that the concept can be expected to receive increasingly serious attention in the next two decades, hence his current study: ‘We are in a time of transition between the institutions of a collapsing old order and a coming World State.’ The old order has left ‘a heap of problems’ which the nation-state system has been unable to solve. Within the World State, each nation-state would be internally independent (like the 50 US states) but all 193 nation-states would be under federal rule. The world would be borderless with free movement of peoples ‘subject to local restrictions to prevent any one city or region from being swamped’, and there would be free trade. In my review of Hagger’s The World Government: A Blueprint for a Universal World Order (O-Books, 2010), I noted that while Hagger said peace and disarmament would be ‘enforced’ by international law under world government, he did not indicate how this would be achieved, although one understood that book was only a ‘blueprint’: how would the World State system actually cope with and enforce ‘rogue states’ such as North Korea, Iran and Somalia? Now, in World State, Hagger envisages a World Armed Force, or Rapid Reaction Force, of 200,000–400,000 personnel, which, under a world authority and with international bases on every continent, would be used to enforce global laws, including those relating to nuclear disarmament — just as the UN’s Peacekeeping Force has been used to enforce laws for the Security Council. Hagger thinks that in the flashpoint Middle East, a World Armed Force would deflect some of the animosity away from the US, UK and NATO presence. The ‘peace dividend’ of a World State would be colossal, he says. The phasing-out of global military spending by nation-states, saving £1.7 trillion a year, minus the cost of the World Armed Force, but plus the saving a not having to replace nuclear weapons. Such a saving would be available to raise the standard of living for the benefit of all humankind. Optimistically, Hagger says there would be no continuation of the ‘war on terror’ after a peace accord covering the whole Middle East, although the World Armed Force would still be patrolling Western Asia ‘coping with outbreaks of insurgency’. Islamic terrorism would be disarmed. The World Bank would be overhauled to operate at a supranational level. It would continue to make loans to poorer countries, and begin a phased redistribution of resources and energy supplies to even up the disparities between regions. Recognising that there are already moves being made by banking elites towards a world currency, Hagger believes it could solve the global financial crisis: there could be a new Earth dollar worth, say, 10 present US dollars. This might involve a massive devaluation of currencies but, at a stroke, it would wipe out nine-tenths of the global debt. If applied everywhere on the same day, it would enable the world to escape from its legacy of debt, and start over. The entire foreign currency market would vanish overnight and the financial sector would go into terminal meltdown but, bearing in mind the fierce influence of unelected markets on the governance of countries, this might not be such a bad thing. 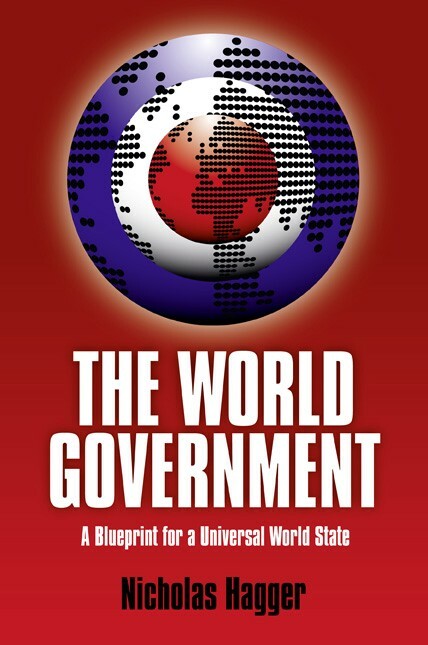 As he did in The World Government, Hagger addresses the sceptical response — that a World State will never happen because of powerful banking and corporate elites with vested interests, and because no nation-state would vote for a reduction in sovereignty. He says governments might see that their compensatory gain in a share of world sovereignty would bring the ‘peace dividend’, with funds previously spent on defence able to be used to assure prosperity for their peoples. Secret cabals and self-interested elites, who exploit the world’s resources and energy, could be circumvented by giving regions more power through strengthened democracy, he asserts. Indeed, in this context alone, there is now a pressing need for a reform of global governance. There seems little doubt, Hagger writes, that such elites have planned to reshape the world and reduce its population to a ‘sustainable’ level by encouraging local wars, spreading disease and exploiting famine, and manipulating Western political life. It is not a model that could achieve the goals Hagger sets out for the World State; a universalist initiative is needed to refocus on the interests of humankind at large. Of course, Hagger admits that in the hands of tyrants or self-interested elites, who would enrich themselves at the expense of the planet’s resources, a World State could be a disaster. But in the control of a philanthropic body of experts and elected representatives it would benefit humankind by providing a better life for everyone. Big questions remain, of course. Where do we find such altruists to bring the world to a new dawn? Do the existing military-industrial complexes actually want global peace? If the world state has to be forced on countries, wouldn’t that involve warfare and be a form of dictatorship, no matter how it was sold as ‘benevolent’? And is there, could there be, the political will? One of the biggest political problems worldwide is the party system where party allegiance and ideology comes first and the needs of the people a poor second. Hagger’s seven goals for the World State remind me of Ronald Higgins’ seminal 1970s work, The Seventh Enemy: The Human Factor in the Global Crisis, which identified six similar goals for the world but which saw the ‘seventh enemy’ as people’s apathy and inertia combined with the ‘myopia’ of governments in the face of those challenges. Forty years on, how much has changed? Higgins died last year, aged 88. 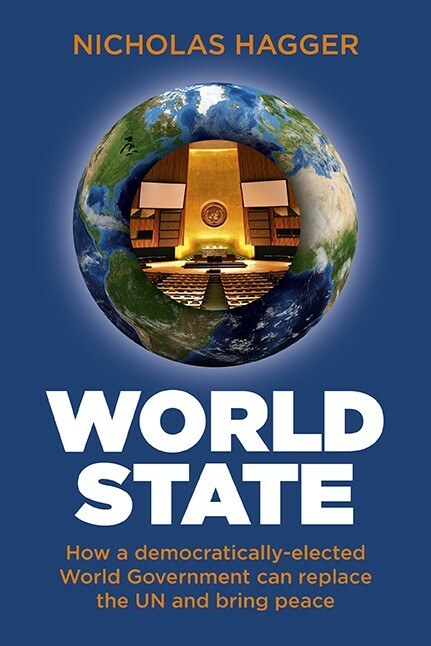 Such questions apart, World State is a timely and authoritative assessment of how we stand as a civilisation today and where we might be, or ought to be, going: an ambitious philosophical vision of a better future for the whole of humankind. A companion volume, World Constitution, contains a constitution for a United Federation of the World that could be put before the UN General Assembly. I have great respect and admiration for Hagger’s impressive oeuvre, especially his literary and philosophical works. Aged 80 next year, he has published 46 books on literature, history, philosophy and travel, including 1,200 short stories, in excess of 2,000 poems including more than 300 classical odes, two poetic epics, five verse plays, and a masque. He has lectured in English literature at the University of Baghdad in Iraq and the University of Libya, and was a professor of English literature at Tokyo University of Education, Keio University and Tokyo University in Japan. He has studied Islamic and Oriental philosophy, and led a group of universalist philosophers. In 2016, he was awarded the Gusi Peace Prize for Literature. Hagger’s catalogued archive of papers and manuscripts is held on permanent deposit as a Special Collection in the Albert Sloman Library at the University of Essex.